This week my most awaited LP of 2018 thus far coming from the inimitable Low on their shadowy electronic masterpiece, ‘Double Negative’. There are synths akimbo on the new one from MCR up-n-comers Pale Waves, reminding me of a more youthful Kristin Kontrol (if only everyone loved that LP as much as I did), or a less saccharine Tegan & Sara. In fact, it’s a very electronic week on the heavy hitters, Those of you who love a good guitar can do FAR worse than The Goon Sax’s new outing on the ever-reliable Wichita Recordings, absolutely brimming with lyrical fire and melodic cleverness, and with the propulsive slacker vibes the Aussies do so well. In 2018, Low will turn twenty-five. Since 1993, Alan Sparhawk and Mimi Parker—the married couple whose heaven-and-earth harmonies have always held the band’s center—have pioneered a subgenre, shrugged off its strictures, recorded a Christmas classic, become a magnetic onstage force, and emerged as one of music’s most steadfast and vital vehicles for pulling light from our darkest emotional recesses. But Low will not commemorate its first quarter-century with mawkish nostalgia or safe runs through songbook favorites. Instead, in faithfully defiant fashion, Low will release its most brazen, abrasive (and, paradoxically, most empowering) album ever: Double Negative, an unflinching eleven-song quest through snarling static and shattering beats that somehow culminates in the brightest pop song of Low’s career. This time, though, Sparhawk, Parker, and bassist Steve Garrington knew they wanted to go further with Burton and his palette of sounds, to see what someone who is, as Sparhawk puts it, “a hip-hop guy” could truly do to their music. Rather than obsessively write and rehearse at home in Duluth, Minnesota, they would often head southeast to Eau Claire, Wisconsin, arriving with sketches and ideas that they would work on for days with Burton. Band and producer became collaborative co-writers, building the pieces up and breaking them down and building them again until their purpose and force felt clear. As the world outside seemed to slide deeper into instability, Low repeated this process for the better part of two years, pondering the results during tours and breaks at home. They considered not only how the fragments fit together but also how, in the United States of 2018, they functioned as statements and salves. Double Negative is, indeed, a record perfectly and painfully suited for our time. Loud and contentious and commanding, Low fights for the world by fighting against it. It begins in pure bedlam, with a beat built from a loop of ruptured noise waging war against the paired voices of Sparhawk and Parker the moment they begin to sing during the massive “Quorum.” For forty minutes, they indulge the battle, trying to be heard amid the noisy grain, sometimes winning and sometimes being tossed toward oblivion. In spite of the mounting noise, Sparhawk and Parker still sing. Or maybe they sing because of the noise. For Low, has there ever really been a difference? Since 2010, Toy have earned a reputation as a band of integrity, virtuosity and taste, with Tom, Maxim, Dominic, Charlie and (joining in 2015) Max creating a sound that is embedded in the underground tradition, yet distinctly their own. Now here comes a two-track twelve-inch on Tough Love, a foretaste of a forthcoming album in January 2019, which marks a new dawn for this most singular of bands. ‘The Willo’ is a dreamlike, seven-minute glide, redolent of a forest at sunset and just as pretty, but not without hints of malevolence. Maxim’s fingerpicking acoustic melds with electric twang from Dominic, and a whirling organ from Max Oscarnold gives this elegant creation an extra layer of disorientation and depth. “People appear to have seen Will-o’-the-wisp, a mysterious green-blue light, over the centuries. It generally means something ominous is about to happen”, says Tom. Then there is ‘Energy’, which lives up to its name with thunderously metronomic drums from Charlie Salvidge and a ferocious guitar from Dominic O’Dair. The lyrics, culled from a story written by Max about a nighttime ritual, are obscured by the barrage-like forward momentum of the music. The twelve-inch, recorded and mixed by the band between Oscarnold’s Stoke Newington flat and a south London studio, is the first release for Toy on their new label Tough Love, representing the latest stage in the evolution of the band. Since their inception, they have released the acclaimed albums Toy (2012), Join The Dots (2013) and Clear Shot (2016), and toured everywhere from Serbia to China, while holding onto that youthful, magical moment of discovering strange new worlds of innocence and experience. The Goon Sax are James Harrison, Louis Forster and Riley Jones from Brisbane, Australia. Still in high school when they made their first album Up To Anything in 2016, their brand of awkwardly transcendent teenage guitar pop took earned them wide-spread critical acclaim. For album number two, they flew to Melbourne to record with James Cecil and Cameron Bird, respectively former/current members of Architecture In Helsinki, and ‘We’re Not Talking’ shows how much can change between the ages of 17 and 19. It’s a record that takes the enthusiasms of youth and twists them into darker, more sophisticated shapes. Relationships are now laced with hesitation, remorse, misunderstanding and ultimately compassion. Drummer Riley Jones really comes to the fore here, joining Louis and James in singing lead and writing songs for the first time, making the band the musical equivalent of an equilateral triangle (the strongest shape in physics). Delivering brilliantly human and brutally honest vignettes of adolescent angst, The Goon Sax brim with personality, charm and heart-wrenching honesty. ‘We’re Not Talking’ is a record made by restless artists, defying expectations as if hardly noticing, and its complexity makes ‘We’re Not Talking’ even more of a marvel. After signing a record deal with Dirty Hit in 2017, Manchester’s Pale Waves released their debut single “There’s a Honey”, followed by “Television Romance”. The following year, the band were ranked fifth in the BBC Sound of 2018 poll and won the NME Under the Radar Award at the NME Awards. They now return with their debut album which features the singles ‘There’s A Honey’, ‘Television Romance, ‘Kiss’, ‘Eighteen’ and new single ‘Black’. To put it simply, True Meanings, the fourteenth Paul Weller solo album and the 26th studio album of his entire career, is a record unlike any he has ever made before. It’s characterized by grandiose-yet-delicate, lush orchestration: an aesthetic to which Weller’s better-than-ever voice, singing some of his most nakedly honest words, is perfectly suited. A dreamy, peaceful, pastoral set of songs to get lost in, it’s both an album that his faithful audience has been wanting him to make for a long time, and an album that many new people outside of that audience will relate to. 50th Anniversary reissue. This double-CD and single-LP collection features a new version of the album’s original stereo mix on both CD and 180-gram vinyl LP, which has been newly remastered from the original master tapes by Bruce Botnick, the Doors’ longtime engineer/mixer. The CD set also includes a second disc of 14 completely unreleased tracks: nine recently discovered “rough mixes” from the album recording sessions and five live songs from a 1968 Copenhagen show. Directed by Academy Award winning filmmaker Murray Lerner, Both Sides Now: Live At The Isle Of Wight Festival 1970 features new interviews with Joni, discussing her recollections of the event intercut with festival footage, both onstage and behind the scenes, offering a fascinating insight into a now legendary concert from the artists point of view and putting the events of the day into context. The Goon Sax are James Harrison, Louis Forster and Riley Jones from Brisbane, Australia. 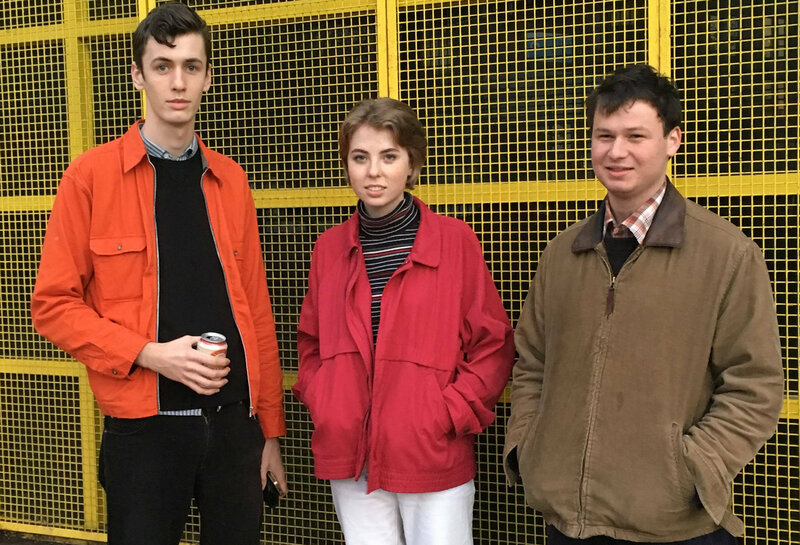 The Goon Sax toured UK and Europe twice on that record, played shows with Whitney, US Girls, Teenage Fanclub, Twerps and Blank Realm, graduated school, and then turned their focus to album number two. They ﬂew to Melbourne to record with James Cecil and Cameron Bird, respectively former/current members of Architecture In Helsinki. Upcoming album We’re Not Talking shows how much can change between the ages of 17 and 19. It’s a record that takes the enthusiasms of youth and twists them into darker, more sophisticated shapes, full of lines like “When the bus went past your house and past your stop my eyes filled with tears” and “I’ve got a few things above my bed but it feels so empty, I’ve got spaces to fill and we’re not talking.” Relationships are now laced with hesitation, remorse, misunderstanding and ultimately compassion. Madison Foley – TrumpetAll songs written by The Goon Sax. Brisbane’s celebrated strum’n’drum teens The Goon Sax With upcoming dates in the UK, France, Germany and other exotic locales, Goon Sax are heading off into a stripy-shirted future of castles, pumperknickel, gondolas and warm beer, and who knows when they’ll be back! Their 2016’s debut album “Up To Anything” brought the band crashing into hearts the world over, earning them end of year best of list nods from Bloggers,Billboard Magazine, BBC 6 and Rough Trade, and spots on bills all over europe including Brighton’s renowned Great Escape..the band might play a raft of new tracks destined for album number two. One Of our favourite bands of the year was Brisbane teen-trio, The Goon Sax. The band continued in a fine lineage of Australian indie-pop heroes, from The Lucksmiths to Architecture In Helsinki, and not least The Go-Betweens, who’s member Robert Forster is the father of The Goon Sax’s Louis. The music on Up To Anything, the band’s debut release is a sublime study on teenage living outside of the cool crowd; it revels in the mundane yet soul-crushing details of growing up, from getting dodgy haircuts off your mum, coming to terms with your sexual preferences and triumphantly tucking into ice cream on your own. Musically, their sound is lo-fi and delightfully unfussy; Boyfriend with its huge chorus and meandering guitars interludes cut through with pulsing rushes of bass and drums, the chugging electric guitars and melodic bass of Sweaty Hands, and the mass sing-along finale of the triumphantly un-triumphant Ice Cream, that is enough to bring a smile to even the most cynical of folk. Best of all is their first single, Sometimes Accidentally, blending a tumbling guitar line with low rumbling bass and perfectly primal drums, it seems to teeter on the edge of falling apart but cling on for its life, lyrically too it seems to be about everything and nothing all at once, even its grand statement seems delightfully unsure of itself, “I don’t care about much, but one of the things I care about is you.” The Goon Sax tap into all the insecurities and doubts of youth and they do so with such exquisite attention to detail, that as a listener you feel you are living those formative days all over again with them.